First Line: Monday, January 14: Midway this way of life we're bound upon, I woke to find myself in a dark wood, where the right road was wholly lost and gone. Linda Van Alstyne kicked her husband, Millers Kill Chief of Police Russ Van Alstyne, out of the house after he told her he'd fallen in love with Reverend Clare Fergusson. Three people are in pain. Linda doesn't know what she wants. Russ wants a woman he knows he can't have, and Clare is at a crossroads. She can't be true to her beliefs and be in love with a married man. All of this misery turns to tragedy when Linda's best friend shows up at the Van Alstyne house and finds the woman brutally murdered on the kitchen floor. The state police believe they have an open-and-shut case because who else could possibly have killed Linda Van Alstyne than her husband and the woman he's having an affair with... the Reverend Clare Fergusson? This fifth book in Spencer-Fleming's excellent series satisfies on so many levels. It raises some very thoughtful questions about relationships and morality in today's world while telling a story that's full of emotion and misdirection. The gossipmongers of small town Millers Kill are perfectly portrayed, and their interference raises the tension of this fast-paced tale. As always, the two main characters continue to evolve. In All Mortal Flesh, Russ and Clare aren't quite as strong and capable as they've been in previous books. Clare seems almost frozen in despair, especially when the church hierarchy sends a deacon to oversee the behavior of their problem priest. Russ is almost brought to his knees by the death of his wife, numb with grief and regret, and reacting like a little boy when his mother arrives at the crime scene-- "short and squat and beautiful." Even Clare needs some of Margy Van Alstyne's quiet, no-nonsense strength, and when she soaks in the atmosphere of the older woman's kitchen, she realizes that it feels like her own grandmother's: "Like you had rounded all the bases and come home safe." Being able to see these two strong people when they're not at their best brings added depth to the story and to the series as a whole. At times the plot seems a bit over-the-top and almost soap opera-ish, but I've grown so attached to these characters that I had no trouble suspending my disbelief. Spencer-Fleming employs some of the best misdirection to be found, and although one of the red herrings didn't throw me off the scent, I was annoyed that I did indeed inhale one of the oldest fish in the trade. Shame on me. Ah well, I'm going to chalk my mistake up to the fact that I was immersed in the story, and practically blind and deaf to the world around me. 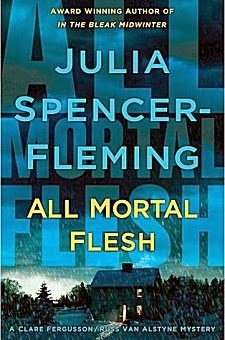 All Mortal Flesh ends in a heart-breaking cliffhanger that makes me want to pick up the next book and dive right in. In this series, the characters' lives mirror the real world. Everything is not wrapped up and tied with shiny bows. This fictional world is every bit as messy as our own lives, and Julia Spencer-Fleming has made me care deeply about what happens to Russ and Clare. Cathy - I'll be honest; I'm always a bit wary of plots where the sleuth becomes the suspect. That plot can be contrived and too over-the-top. But this one sounds different. Somehow it seems to fit together and I give Spencer-Fleming a lot of credit for being able to do that. And of course, I like those characters very much. Yes, that plot does have its risks, but the author deals with them very well.